Between 2009 and 2017, the price of solar panels per watt declined by 75 percent while the price of wind turbines per watt declined by 50 percent. The price of nuclear and coal in those place during the same period was mostly flat. Another hypothesis might be that the closure of nuclear plants resulted in higher energy prices. Since 2010, California closed one nuclear plant (2,140 MW installed capacity) while Germany closed 5 nuclear plants and 4 other reactors at currently-operating plants (10,980 MW in total). 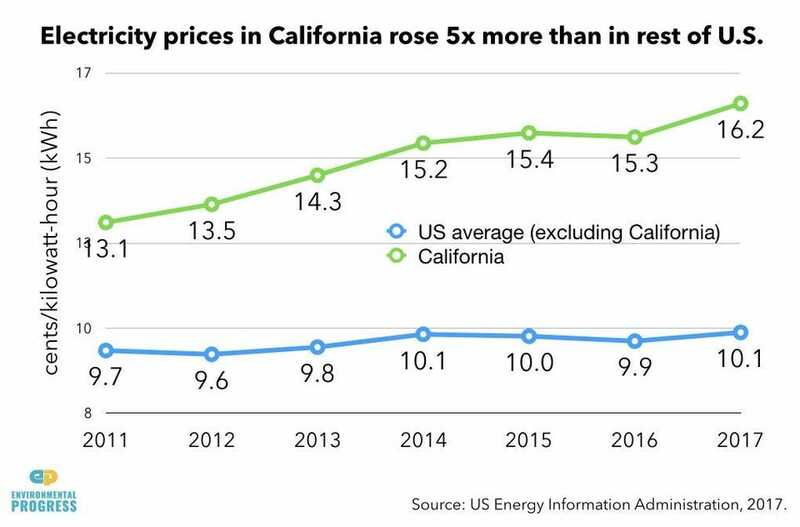 But this hypothesis is undermined by the fact that the price of the main replacement fuels, natural gas and coal, remained low, despite increased demand for those two fuels in California and Germany. That leaves us with solar and wind as the key suspects behind higher electricity prices. But why would cheaper solar panels and wind turbines make electricity more expensive? The main reason appears to have been predicted by a young German economist in 2013. In a paper for Energy Policy, Leon Hirth estimated that the economic value of wind and solar would decline significantly as they become a larger part of electricity supply. The reason? Their fundamentally unreliable nature. Both solar and wind produce too much energy when societies don’t need it, and not enough when they do. 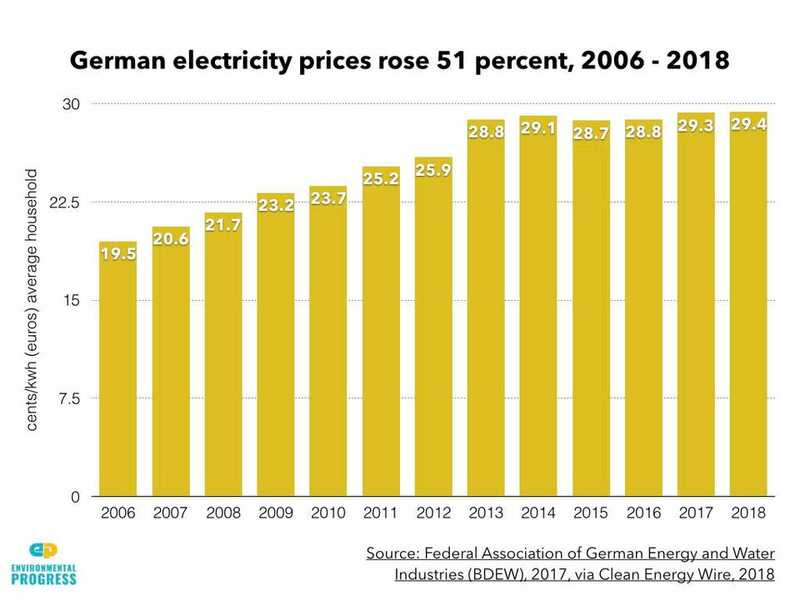 And unreliability requires solar- and/or wind-heavy places like Germany, California and Denmark to pay neighboring nations or states to take their solar and wind energy when they are producing too much of it. Part of the problem is that many reporters don’t understand electricity. They think of electricity as a commodity when it is, in fact, a service — like eating at a restaurant. “The price we pay for the luxury of eating out isn’t just the cost of the ingredients most of which which, like solar panels and wind turbines, have declined for decades. Rather, the price of services like eating out and electricity reflect the cost not only of a few ingredients but also their preparation and delivery. This is a problem of bias, not just energy illiteracy. Normally skeptical journalists routinely give renewables a pass. A good start would be for them to investigate why, if solar and wind are so cheap, they are making electricity so expensive. The long-term cost of supplying grid electricity from today’s lithium-ion batteries is falling even faster than expected, making them an increasingly cost-competitive alternative to natural-gas-fired power plants across a number of key energy markets. That’s the key finding from a Tuesday report from Bloomberg New Energy Finance on the levelized cost of energy (LCOE) — the cost of a technology delivering energy over its lifespan — for a number of key clean energy technologies worldwide. According to its analysis of public and proprietary data from more than 7,000 projects worldwide, this benchmark LCOE for lithium-ion batteries has fallen by 35 percent, to $187 per megawatt-hour, since the first half of 2018. This precipitous decline has outpaced the continuing slide in LCOE for solar PV and onshore and offshore wind power. Over the past year, offshore wind saw a 24 percent decline in LCOE to fall below $100 per megawatt-hour, compared to about $220 per megawatt-hour only five years ago. The benchmark LCOE for onshore wind and solar PV fell by 10 percent and 18 percent, respectively, to reach $50 and $57 per megawatt-hour for projects starting construction in early 2019. To be sure, these generation technologies are still far cheaper than batteries in terms of their LCOEs — and that’s not mentioning the fact that they actually make electricity, rather than simply storing it for later use. 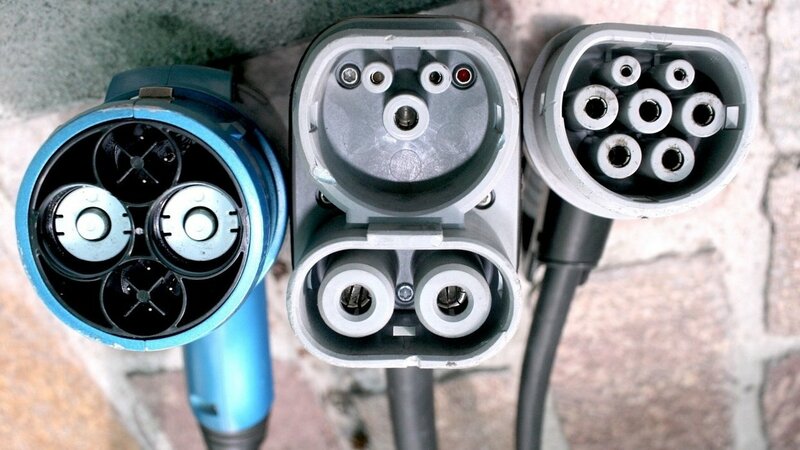 To convert a battery’s storage capacity into a LCOE figure, the report models a utility-scale battery installation running daily cycles, with charging costs assumed to be at 60 percent of the wholesale base power price for the country in question. Even so, the pace of the decline in battery LCOE, particularly for multi-hour storage applications that previous generations of lithium-ion technologies have struggled to provide, is startling, BNEF notes. Since 2012, the benchmark LCOE of lithium-ion batteries configured to supply four hours of grid power — a standard requirement for many grid services — has fallen by 74 percent, as extrapolated from historical data. In comparison, the LCOE per megawatt-hour for onshore wind, solar PV and offshore wind has fallen by 49 percent, 84 percent and 56 percent, respectively, since 2010. 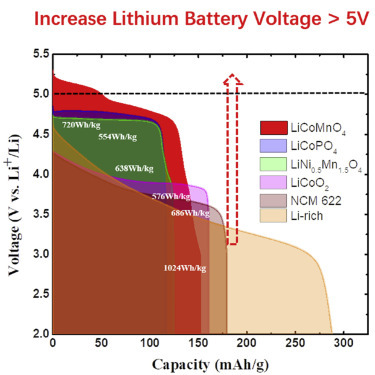 In fact, the LCOE for multi-hour lithium-ion batteries is falling to the point that “batteries co-located with solar or wind projects are starting to compete, in many markets and without subsidy, with coal- and gas-fired generation for the provision of ‘dispatchable power’ that can be delivered whenever the grid needs it (as opposed to only when the wind is blowing, or the sun is shining),” the report notes. These findings match those we’ve been covering from our own analysts at Wood Mackenzie Power & Renewables, as well as from the broader industry. In the past year and a half, several large-scale solar-battery requests for proposals have set record-low prices, including Xcel Energy in Colorado with solar-plus-storage bids as low as $36 per megawatt-hour, compared to $25 per megawatt-hour for standalone solar, and NV Energy reporting even lower bids in its solar and solar-plus-storage RFPs. These price points equate to about a $6 to $7 per megawatt-hour premium for solar projects that are partially “dispatchable” in the manner of a traditional power plant, compared to standalone solar, Ravi Manghani, WoodMac energy storage research director, reported at Greentech Media’s Energy Storage Summit in December. Just this week, clean energy advocacy and research organization Energy Innovation and Vibrant Clean Energy released a report finding that the LCOE of new renewables in the U.S. is lower than that of nearly three-quarters of the U.S. coal fleet — a not completely surprising finding, given the coal power industry’s well-documented challenges in competing with cheap natural gas, and increasingly cheap wind and solar power. At the same time, it’s worth noting that the current trends in pricing for lithium-ion batteries, what they actually cost today, has been mixed. While continuing technology improvements and increasing scale of manufacturing have continued to push down prices, these have been somewhat counterbalanced in the past year or so by a bottleneck in available supply, driven by a boom in demand from big projects in the U.S. and South Korea. WoodMac discovered that battery rack prices fell by only about 6 percent from 2017 to 2018, rather than the 14 percent range previously predicted, based on these supply shortage challenges. While EVs have come a long way — even Ford is making electric trucks — they’re still a far cry from perfect. One of the biggest complaints is that the batteries need to be plugged in and recharged, and even when they’re charged, they have a limited range. Fuel cell electric vehicles offer an alternative. Their “battery” — actually a hydrogen/oxygen fuel cell — can be replenished with hydrogen gas. The biggest problem to-date has been that producing hydrogen isn’t an environmentally friendly process. We would also need the infrastructure to refuel with hydrogen. But, new technology from UMass Lowell could remove those barriers. Researchers there have created a way to produce hydrogen on demand using water, carbon dioxide and cobalt. Theoretically, that would go directly into a fuel cell, where it would mix with oxygen to generate electricity and water. The electricity would then power the EV’s motor, rechargeable battery and headlights. According to UMass Lowell, the hydrogen produced is 95 percent pure, and vehicles would not need to be refueled at a filling station. Instead, owners would replace canisters of the cobalt metal which would fuel the hydrogen generator. Because the technology can produce hydrogen at low temperatures and pressures and because excess isn’t stored in the vehicle, it minimizes the risk of fire or explosion. 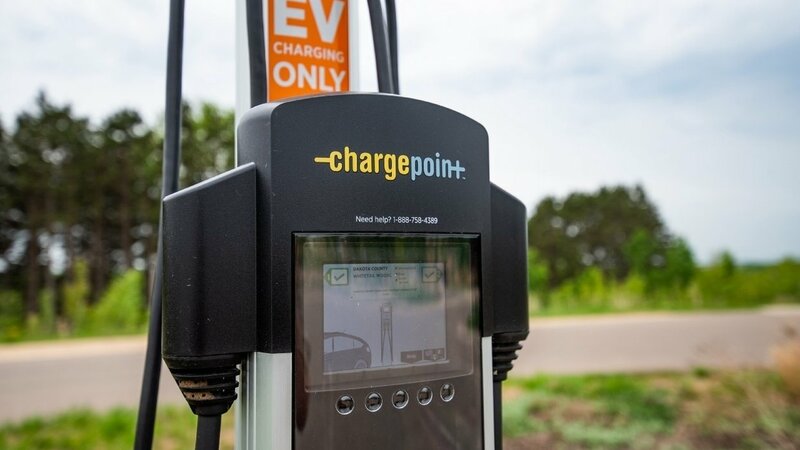 While this isn’t a practical application yet, it could help make FCEVs a viable option. In a statement from UMass Lowell’s Chemistry Department Chairman Professor David Ryan below said that vehicles would not be refueled at a fueling station. The system that we have devised would not require the vehicle to be refueled at a hydrogen filling station. Our technology would use canisters of the cobalt metal as the fuel to operate the hydrogen generator. Australian scientists have unlocked a new and more “efficient” way to turn carbon dioxide back into solid coal, in a world-first breakthrough that could combat rising greenhouse gas levels. Researchers at Melbourne’s RMIT University have used liquid metals to convert CO2 from a gas to a solid at room temperature. The technique has potential to “safely and permanently” remove CO2 from the atmosphere, according to the new study published in the journal Nature Communications. Carbon technologies have previously tended to focus on compressing CO2 into a liquid form, transporting it to a suitable site and injecting it underground. The use of underground injections to capture and store carbon is not economically viable and sparks fears of an environmental catastrophe due to possible leaks from the storage site. However, the new technique transforms CO2 into solid flakes of carbon, similar to coal, which can be stored more easily and securely. Carbon dioxide is dissolved into a beaker containing an electrolyte liquid, then a small amount of the liquid metal catalyst is added, which is then charged with an electrical current. The electrical current serves as a catalyst to slowly converts the CO2 into solid flakes of carbon. This is a “crucial first step” to developing a more sustainable approach to converting CO2 into a solid, RMIT researcher Dr Torben Daeneke said, noting that more research is required cement the process. He described the process as “efficient and scalable”. “While we can’t literally turn back time, turning carbon dioxide back into coal and burying it back in the ground is a bit like rewinding the emissions clock. “To date, CO2 has only been converted into a solid at extremely high temperatures, making it industrially un-viable,” Dr Daeneke said. The study’s lead author, Dr Dorna Esrafilzadeh, said the carbon produced could also be used as an electrode. 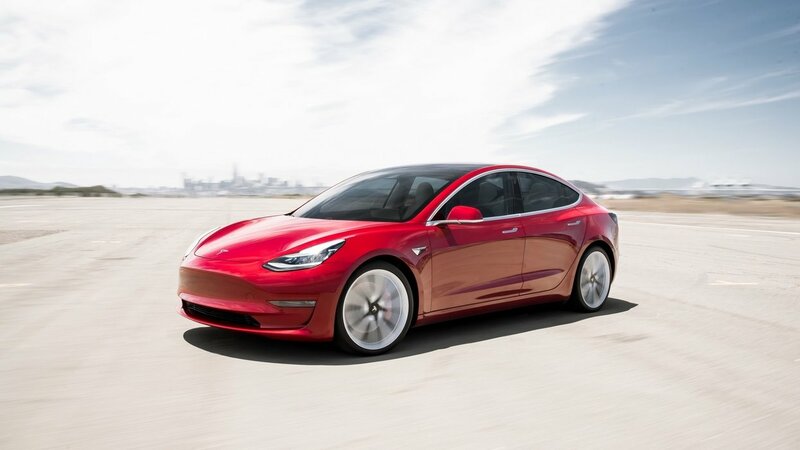 “A side benefit of the process is that the carbon can hold electrical charge, becoming a supercapacitor, so it could potentially be used as a component in future vehicles,” she said. The study was completed in collaboration with researchers from Germany (University of Munster), China (Nanjing University of Aeronautics and Astronautics), the US (North Carolina State University) and Australia (UNSW, University of Wollongong, Monash University, QUT). Makani, which makes a kite-based wind power generation device, secured a partnership with Shell’s wind development arm to test the technology offshore. The deal makes Shell a minority shareholder in the startup, although further details of the terms were not disclosed. Back in December, X (formerly Google X) spun out another far-out energy startup called Malta, which converts electricity into thermal energy and back again. That company raised $26 million from Breakthrough Energy Ventures, Concord New Energy and Alfa Laval. Another energy concept, Project Foghorn, would have synthesized carbon-neutral fuel from seawater, but the team discontinued the effortdue to the challenges of achieving cost-competitiveness with gasoline. The preliminary achievements of the three projects are all the more notable because groundbreaking energy hardware has been anathema to venture investment for years, since the big busts of the first cleantech investment boom. Investors lost big with expensive bets on thin-film solar and biofuels, technologies which largely failed to overcome their mainstream alternatives. “We’ll be drawing on Shell’s extensive engineering and operational expertise with floating structures to make this transition,” Makani CEO Fort Felker wrote in a blog postWednesday. The oil and gas supermajor separately invested in a different floating wind technology Wednesday. It acquired a 66 percent stake in the €18 million TetraSpar demonstration project, which will mount a 3.6-megawatt turbine 10 kilometers from the coast of Norway in waters 200 meters deep. The No. 1 U.S. automaker is counting on profit from sales of conventional large pickup trucks and sport utility vehicles in North America to fund its electrification push. GM said last November it was doubling resources allocated to developing electric and self-driving vehicles, as part of a significant restructuring that included ending production at five North American plants. Amazon has also invested in self-driving car startup Aurora Innovation Inc, in a $530 million funding round announced last week. The world’s largest online retailer has steadily increased its logistics footprint, building warehouses around the world and inking deals with Mercedes as well as cargo airlines to help with delivery.